For your dog's wellbeing always ensure that the Canine pool that you choose is a current member of either The National Association of Registered Canine Hydrotherapists (NARCH) or of The Canine Hydrotherapy Association (CHA). All pools regulated by these associations ensure good standards and will require veterinary consent before allowing your dog to swim. Well-dogs Hydrotherapy Treatments are carried out in our generously built in-ground 6m X 4m pool which is heated to the optimal temperature for muscle and joint use of 30 C.
Our large pool allows for your dog's natural swimming behaviour and the use of toys for motivation, helping to increase joint flexibility and muscle strength. Ramp entry to the pool is achieved via a built in concrete non-slip ramp that allows safe, gradual entry for dogs with walking difficulties or those who may be more nervous. The ramp ensures that NO hoist is needed for your dog, if necessary invalid dogs can be carried into the pool using a stretcher. A swim resistance jet is available for use with dogs as their fitness improves to build stamina, strength and muscle tone. The swim jet is an ideal aid to fitness training for all canine athletes and working dogs. 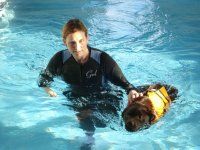 All dogs are fitted with the appropriate floatation device or harness depending on their requirements before entering the pool with a trained Canine Hydrotherapist. It is important that pool water is removed from your dog's coat and shower and drying facilities are available. Showering and drying can be done by you, or dogs can be rinsed and dried by us within the 30 min appointment time. The building and pool area have disabled and wheelchair access and toilet facilities. An area to change clothing if you wish to enter the pool with your dog is provided. Please note for your dog's well-being, Well-dogs always work alongside you, and your veterinarian. Therefore a veterinary consent form must be completed for all dogs prior to any treatments. All clients must agree to the terms and conditions of Well-dogs. (Click here to download a copy of our terms and conditions).